The goal of the game of Oh, Hell is to be able to guess how many times you will play the highest ranked card among your friends in a round of the game. Being accurate in this guess will get you bonus points and help you defeat opponents whose guesses are not as precise as yours are. Be careful, though. In each round at least one person will fail to win the number of tricks she bid. Oh, Hell may be played by three to seven players. The number of players determines the number of cards dealt to each. Deal 10 cards to each player to start a game of three to five players. Deal eight cards if there are six players and seven cards if there are seven players. Oh Hell is composed of multiple hands. For each new hand deal one less card to each player than the previous hand. After the hand with one card per player, deal one more card to each player until you play a hand with the same number of cards for each player as you did in the first hand. Tricks are taken when each player plays a card. But before that, each player bids how many tricks he thinks he can win before the play starts. 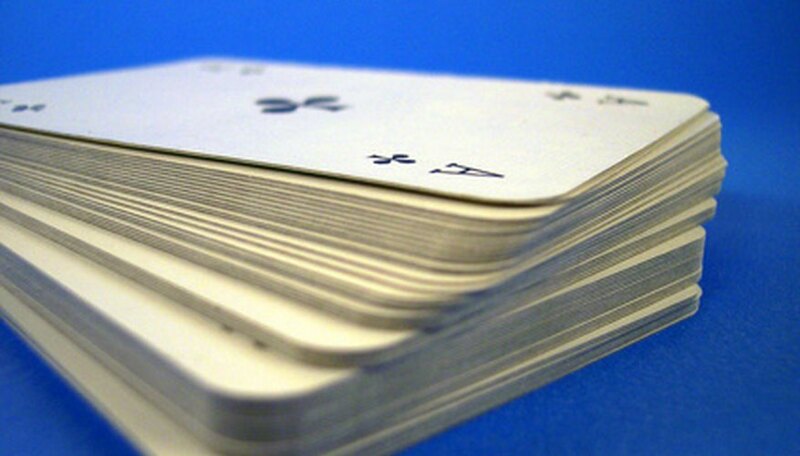 A trick is won by the player playing the highest card in the suit that was led, or the highest card from the trump suit. A trump card can only be played when a player does not have a card in his hand matching the suit that was led. If a trump card is played on a trick it ranks higher than any card in the suit that was led. After dealing the cards to each player to start the round, the dealer flips up the top card of the deck. The suit of this card is the trump suit. Each player then bids how many tricks she thinks she can win, with a bid of zero being permitted. The dealer bids last. The dealer must add up the bids made before him. He cannot bid an amount that would bring the total amount of tricks bid to equal or less than the number of cards dealt. As an example, in a four player game with 10 cards dealt to start the game if the first three bids are one, two, and three, the dealer must bid at least five to bring the amount bid to 11. He can bid more than his minimum required bid if he wishes. Each round is scored separately, and then the scores for each round for each player added up at the end of the game to determine the winner. A player scores 10 points plus the number of tricks she bid if she wins the exact number of tricks she bid. If a player fails to win the exact number of tricks bid, he scores zero points for that round in traditional scoring. Another option is to award one point for each trick won to players that fail to match their bid, but the ten-point bonus for the exact bid is not added to that player's score. In a seven-player game there are 13 rounds, 15 in a six-player game and 19 rounds in a three-to-five player game. Pagat: Rules of Card Games: Oh Hell!